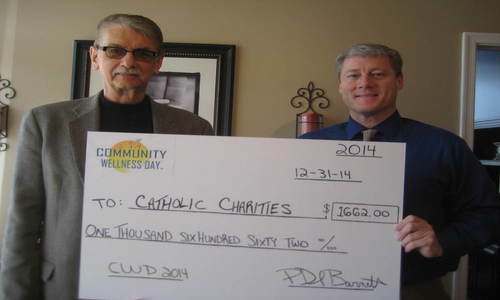 On December 31, 2014, Catholic Charities was presented a check for $1662.00 by Dr. Dan Barnett from Barnett Chiropractic Center in Endwell. The check represented proceeds from the Wellness Day Event held last summer at Highland Park. The event was hosted by Barnett Chiropractic and the dental practice of Dr. Louis M. Giordano. We thank them for their generosity, and their support of our mission!